Seriously, did you see that catch Mather made? I know he is not known for his defense usually, but there is no way Duncan comes even close to a ball hit that sharply. John called for this move in the blog a while ago I think, and I definitely believe it was a good move. They can now rotate two RH and two LH hitters in the outfield with Barton playing the PR, defensive sub role he is better suited for. The team is playing pretty well right now, but if things can improve, it is on the offensive end. I'd personally like to see Brendan Ryan play instead of Izturis more. Izturis has hit better recently, but for a while he was doing worse than the pitchers and actually DESERVED to bat ninth. He is a good defensive player, but so is Ryan. I really think LaRussa likes Ryan on the bench because he can play any infield position. That's all well and good, but I say let your best players play every day. I've never been a big platoon guy, but maybe I shouldn't be complaining. We are ten games over .500, so LaRussa must be doing something right. A 6-1 victory over the Astros after an 8-2 loss will always make you feel a bit better. The Cardinals took an early lead based mainly on mistakes. I would have rather seen them get a few more runs in the first with 3 on and 0 out. But I guess I'm just greedy. It didn't matter as WW was up to the task. 3 hits in 8 ip, 8k's, and 1 er. Niiiice. This is the WW we all love and EXPECT now. Ankiel had a very nice catch--and that makes up for that horrible throw from throw from yesterday. Now about Pujols tryin' to take 2nd on the Luds flyout to right. Now I know that everyone loves him and he does seem to make quite a few errors on the basepaths. But if we are going to praise him when he takes the chance and it pays off we can't jump all over him when it doesn't pay off. Pence has got a noodle (see him in action here). Luds is out. It could have made something happen. The only real complaint I have is that he didn't stay on the bag. Ehh "we'll call it a draw." With the Cubs pulling "W's" faster than disenfranchised republicans and their bumper stickers, we need to win games against pitchers like Wandy. With the likes of Oswalt comin' up the hill today, we'll need another strong offensive performance and the good Lohse to show up. Although, Oswalt has been less than stellar this year... It's still Oswalt. That could just mean he's due. I'm a sore loser today. Though I'm still a true cardinal and my least favorite team is the Cubs, living in Houston has made be REALLY hate the Astros, so I'm extra angry after last night's loss. I know we have a tough time against them at their place (because they can cheat there), but I expect us to do better at home. Looper has been the anti-Wainwright so far this year. Good record, but horrible ERA, WHIP and BAA. If Mulder can (by some miracle) come back and rejoin the rotation, Looper may be the guy we should send back to the bullpen, and not Wellenmeyer. On the plus side, the bullpen again pitched great and Albert went deep. Hopefully, that means he is mentally recovered from that disturbing game he had against the Padres last week. Anyway, they had better win today.......or I don't know what I'll do....but it won't be pretty. As a case study, last night's game was fascinating. The Cardinals got out hit 7 hits to 4. The Cardinals only had 6 AB's turn into base-runners. This is usually not a recipe for success. 4 hits in one game. How many times do you think that will garner you a win? If you said 19 times outta 20, I'd take the over. "Only 4 LOB!" the masses proclaim. "OooooOOOooo Only 1 Team LoB," the peons announce. This is how numbers are deceiving. Why so? Because, as we have mentioned before, OBP means men on base to get stranded. What does that leave us? It leaves us with RiSP/Clutch strength or luck. Does a good team just try to produce hits (preferably extra base hits) in such quantity that hopefully due to the mass production of said hits some will be close enough in proximity that a runner will eventually reach the fourth base? Does a good team intentionally rise up and are able to string together hits when the pressure is on? Teams like this are full of players who are "clutch" and statistically do better with RiSP? Ask a stat junkie if clutchness exists and you'll get a clear and to the point: "No, way." Ask someone who has played ball before or who is currently playing ball and you're sure to get: "Absolutely." Does Pujols bat 3rd because he just gets hits more often than others and thus since people with high OBP are ahead of him he will improve the proximity hits? Or does Pujols bat 3rd because when the pressure is on he performs stronger than others? The answer is in the middle. It always cracks me up to read those Baseball Prospectus-esque articles that compare how a player does normally versus how they do "in the clutch" and they say, "The stats show that he doesn't do any better with RiSP." Of course not! But the question we should be asking is: "Does he do worse?" If someone maintains their Avg or Slugging % with RiSP it means that all the heightened psychology of the situation does not get to them as badly as others. Why would we expect someone to do better?! What a weird suggestion. Yet, to say that the law of averages have nothing to do with it is just as weird. Last night's game told us 1 of the following: 1) the pressure did not get to the Cards' bats during the one inning and they got lucky to gets the hits in such close proximity or 2) the pressure got to Penny as he gave up another big inning (see his recent previous outings). The truth is probably somewhere in the middle. So what am I getting at with all this? The Cardinals are going to get some nights like last night where they had no business winning the game (from an offensive standpoint) but pull it out after all. Sorry for the grammar errors in the last post. There will be more most likely, but I'll try to at least proof read before I hit "submit" in the future. Anyway, I wanted to post how Adam Wainwright had pitched us to another win tonight, but the game is delayed currently with one out in the bottom of the ninth and I want to go to sleep (how is it raining in LA hard enough to delay the game?). I'll just say what I want to say and ASSUME Franklin saves the game. Wainwright should be, by all rights, only our #3 starter behind Mulder and Carpenter, but instead, he's the ace. And he's pitched like it. That's pretty remarkable for a guy in only his second year starting in the big leagues. Granted, he's seen some pressure closing games in the playoffs, but starting is a different ball game. This year, however, he has continually gone deep into games, saving the bullpen and giving us a chance to win. His W-L record isn't stellar, but his ERA and innings pitched count are. The other guys seem to be following his lead as well. I know expectations aren't as high for the other guys, but that makes Wainwright's performances that much better in my opinion. He HAS to be the man for us to contend, and so far, he's lived-up to that billing. Oh yeah, and Ludwick hit another (hopefully) game winning HR tonight. Sick. Seriously, that's what happens when the skin is broken and blood is exposed to oxygen. In all seriousness, I am a huge cardinal's fan and have been basically since I can remember thinking at all. I want to thank John for letting contribute to this blog. It's going to be great fun for me to talk baseball with him again. Sadly, I have a lot of venting to do because I've stuck in Houston the last four years. That's right, surrounded by astros' fans and going to games in that mockery of a ballpark known as Minute Maid. I wore my cardinal's hat every day to class though and endured the abuse. Oh, and I was watch game 5 of the 2005 NLCS with some "friends" and got whoop and holler and yell "in your face" when Pujols hit that memorable bomb off Lidge. Of course, we lost the next game and the series, but it was a sign of good things to come in 2006 at least. Speaking of good things, watching the Cardinals this year has surprisingly been (usually) one of them. I'm back in Oklahoma now, and more of my own kind are here, so I feel liberated and optomistic. I'll admit, I wasn't that way in spring training. Few proven bats in the lineup and even less in the rotation. So, though there is a long way to go, I'll be hopefull that I'll do less of the venting I promised earlier and more praising the way this team has defied the odds and played winning baseball. I wouldn't want to share my blog with anyone. In fact, Trey would probably be the only exception. However, when I asked him if he blogged, he knew exactly what I was thinking. Trey knows Cardinals. Knows baseball. Here we are. Two friends. One ocean and several years separating us. I'm glad Trey will be contributing to this blog and I'm looking forward to his posts and insights! I don't have much time today. I am under the gun with a paper due tomorrow and I can't believe I'm going to even take time out today to see the Irish Premier of Indiana Jones. So...I'll be brief. Let me simply start by saying that my best wishes go out to Chris Young and Josh Bard. I hope they recover quickly. You hate to see a team get injuries especially when they're down on their luck these days. Next, I'd like to say that the Cards were fantastic last night. Pounding out 16 hits in a rout to win the series. It could have easily been a sweep, but I guess I should never complain about taking 2/3 on the road. I'm going to take a moment to say that Pujols is a classy fellow. Sure, he'll let you know how he feels. And he'll tell ya when you've screwed up. But wow. Pujols was visibly upset. As soon as the play was over he hovered near the mound in concern. Soon he was joined by Adrian Gonzalez as they bowed their heads in prayer. After taking out Bard's leg at home-plate, anyone would be shaken. El Hombre is El Hombre...but he's still a man. And any man would not be able to think straight after that--especially the Young injury. TLR even took him out in the 8th. I hope that this doesn't have any long term effects on Young, Bard, or Pujols. Am I wrong, or is this the first break of the season for the Redbirds...(checks schedule in the sidebar)...since the 14th of April?! Common people! 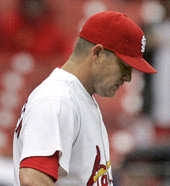 The Cards went from red hot, to slumping, to playing well again. Over a month of baseball without a day off?! Give the guys a break. I hope the Redbirds enjoy today. They've earned it. Perhaps some might think that it allows them to build up momentum. More likely not. Whoever is in charge of scheduling needs to be, as they say over here, sacked. I'm glad that Pujols gets the day off after that harrowing game. Lost amidst all the other stuff going on: Schumaker makes an insane catch, and guess who's back...Ankiel gets a pinch-hit homerun. Wish me luck on my paper. And I hope Indy is as good as the previous ones. Guess I wasn't as brief as I thought I'd be. Was all the difference...Too bad. J.P. pitched a decent game and the bullpen did alright. The offense really let us down. Is it just me or do the Cards seem to let down pretty hard after a big night at the plate? Although, I do like to see Luds batting behind Pujols. I think that is a big part of Pujols' seeing more pitches lately. However, I do not like Duncan as a number two. Furthermore, while I do like having the speedy Barton on the bench, he is simply not cutting the mustard. 2 more K's. And an 0-4 on the evening...leading off. "Excuse me? I'm kinda new to this whole...baseball...thing.... Call me crazy. But aren't lead-off men supposed to...I don't know...get on base?!" This message brought to you by the letters M and A and T and H and E and R.
I was about to make a post about how LOB and high OBP is a sign of a team that doesn't hit enough HR's--something Earl Weaver would have appreciated. But then last night happened. 4 HR's and an 8 run performance. The 19 LoB is a deceptive stat. The team LoB of 11 is better. And the education of Cardinal John continues. What is more, even Izturis got into the act. Cards were really lucky to not have to face a healthy Peavy--or even an unhealthy one. Pujols' upper deck HR was absolutely sick. It was a frozen rope. The tape measure 405 feet does not do it justice. Am I the only one who hates how they measure those things? There's no way that a ball seemingly still going up into the 3rd basket of the Western Metal Supply Co. building only went 405. Ludwick continued his hotstreak by hitting his 4th homerun in 7 AB. The next person that mentions trading him while he's hot is going to get a beatin'. I don't want him being the next (offensive) Danny Haren. What's crazy is not just his OPS but his cumulative stats for how few AB's he has. Have I mentioned that I hate Minute Maid Amusement Park? I'm glad to see Jimmy Ballgame still up to his old tricks--even if it is in that horrible uniform. Looks like the struggling Padres were exactly what the Dr. ordered. Doo doo doo doo doo. Doo doo doo doo. You unlock this season with the key of imagination. Beyond it is another dimension - a dimension where the Rays are 8 games over .500, a dimension where Edmonds is a Cub, a dimension without Izzy. You're moving into a world not of a rebuilding season but a hot start, now a slump and questions. You've just crossed over into the Cardinal Zone. Portait of a slumping ball club: the St. Louis Cardinals, 2008, NL Central, 3 games out, and a strikingly young team. Pujols has just had his OB streak come to a screeching halt--a streak where he spent the last month and a half getting on base, the onset of which took place amongst a searing start from the Cardinals. But these last few weeks have been dissimilar than from before, in a ballpark very much like the one which the Cardinals are about to play the Rays in interleague play, tonight, the Cardinals are at home yet on their way to a destination which, unbeknownst to the Cardinal fans, happens to be in the darkest corner of the Cardinal Zone. Astros! Astros! I'm not imagining it! They're out there. Look they're out there now! They jumped passed us when you weren't looking! 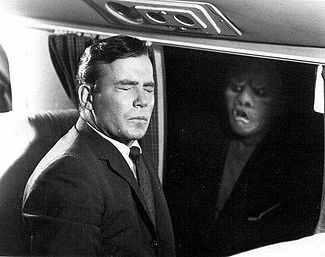 "There's something out on the wing! Some...thing!" And if you look to your left...you'll see the Astros passing us in the standings. The last of the killer B's is hammering away like never before. Sure, a lot of it has to do with the Crawford "can of corn homerun" Boxes. But he has always been underrated. Anyhow, here we are, mediocre/poor starting pitching and abysmal offense make for losses. Pujol's streak comes to an end and the bullpen does well. So which is the real Cardinals of 2008 and which is the twilight zone? The team that started the season or the team that is mired in a offensive and bullpen funk? Only time will tell. Perhaps today may contain a hint of reality. In a Saturday matinée (which means that I won't have to kill myself to stay up to watch it over here in GMT), Wainwright takes the hill and Perez should be available after only 17 pitches last night. Let's hope Pujols and co. avoid those evil donuts and show some patience. The season of the St. Louis Cardinals is far from over now, a season not only from April to October, but also from the fear of recurring bullpen breakdown. The Cardinals have that fear for a while longer, though, for the moment, the Cardinals have this assurance: LoB can be a good thing--'cause it means runners are getting on base. Single digit LoB is usually a sign of a LOSS. Happily this fear won't hang over our heads for long, either the thread will hold or the Sword of Damocles will come crashing down. This tangible manifestation is very often left as evidence of trespass, even from intangible a quarter as...the Cardinal Zone. What good is a solid rotation if the bullpen is going to piss it away every time? Look, I love Izzy. He did some great things, but he is missing his spots, leaving balls up, and is getting hammered. Albeit, Bay's homerun was weak sauce. But that wasn't even the BS...walking the leadoff man...again?! Doing his best Tigers 2006 World Series impression?! Villone wasn't pretty either. This bullpen is in shambles. I still think that the Cards need a bigger bat, but I don't know where one is going to come from. Perhaps it would be best at this time to realize that a big bat won't be ready till the trade deadline--maybe not even then. Finding another couple arms for the bullpen would be an easier task in my estimation. With the amount of LoB I still think it's just a matter of time till the runs come around. Heck even Izturis' bat is picking up. But we have no chance of winning games if the bullpen gets tagged for more runs than the starters do--that's just not good baseball. The problem right now is: our two biggest pieces of trade bait aren't going to solve the Cards' problems. We really blew it on Reyes. I don't see anyone wanting to pick him up. Duncan, although batting better lately, is still a liability in the field. Seriously, I'm embarrassed to watch him play left field. It's not a pretty sight. (Fair enough, he'd play it almost as good as me...yes, I'm that bad). We're inching much too close to .500 for my tastes. And in the division that we are in...it could be costly. It's all over but the signing. Even if Jimmy wants to be a Cub to stick to those who traded him, he'll always be a Cardinal to me. Besides, it was that defiant attitude that we all loved about him to begin with. No, I won't like to see him in Cub blue. Overall, I don't feel that this is the best opportunity for him. I think that the Cub fans won't want him there, it will hurt his restaurant, and won't win any friends within Cardinal nation. Honestly, I thought that the Cards were MORE than loyal to him. The deal he got at the end of the 2006 season was MORE than generous. On the other hand, TLR's comments "that we don't need another left handed AB" (can't find my source...it disappeared on me) don't seem to help matters much as it appeared rather dismissive--but it was probably beyond that anyway. For me it's shame, but if I could be there at Busch, I don't care if I'm the only one standing, I'll be applauding on my feet chanting "Jimmy! Jimmy!" SAY IT AIN'T SO, JIMMY! Seriously. Relax. Don't do it. It's okay. The sky is not falling. When you think about how many times the Cardinals have had 6+ runs put up on them, you should be glad. Wainy had one bad inning. That's allowed. We all knew he wasn't Gibby. Yes, I know, I've been talking to my 8 week old baby so much that it's effecting my languagy. GET A FREAKING NEW BAT FOR THE LINEUP! Okay...you can worry a little. I was almost too disgusted to post. But then I got to thinkin'...who's really to blame. Earlier I watched the Mets crush the Dodgers. Brad Penny had a rough outing. I watched as pitches which were down or out of the strikezone got golfed into the outfield. Several deflections led to some infield hits. Penny wasn't pitching great...but he wasn't pitching that bad either. "Wait...wait...wait!" you say. "What do the Dodgers have to do with the Cards' game last night?" Izzy was and has been getting hammered. By and large, we're not talkin' bad luck. People are launching on him like a pack of Mentos in a two liter of diet Coke. Sure, Pujols slipped up. He does from time to time. But there are still a fair amount of you out there who keep clamoring for him to "be held accountable." To those who keep claiming this...you are silly. Go back to your corner. Annnnnyhoo...where was I? Oh yea! It's not just Izzy. He was put in a tough situation. It's the bullpen in total. Apparently, TLR has confidence in the bullpen: "We have a bullpen that can shut them down, but it just didn't do it." I don't know if this is well founded. Give me more than three occasions where the bullpen looked like it could shut anyone down and I'll grant TLR's claim. But I don't think there are! Some people want to chalk up the loss to the bats. Yes, it is true that 3 runs is below average for the Cards (they're averaging about 4.7 per game this year). But 4.7 is only .1 per game above the league median (yes, I was too lazy to do the averaging). Yes, the need for a better bat still weighs heavily--and is rightly the priority. However, the bullpen should not give up 4 runs in 2 innings. I suggest that 1.7 runs below your average in a game is not half as bad as giving up 4 runs in 2 innings. The goat, as C70 would say, is the bullpen. ...and it's not for taking pictures. Other than preserving a "W" for the Cards, the best thing about his two throws (which, if you haven't seen click here) is that many teams are going to seriously think twice before running on him in the future. What's amazing on both the throws was his accuracy from such a distance...ironic, no? So...TLR was obviously trying to get the bullpen some rest. But I wouldn't be too surprised if there is some hesitancy to pass on close games to the bullpen. Nevertheless, it was good to see Looper go that long. Although it did get a little shaky at the end. I'm going to have to chalk this one up as "losable". No, not all 1 run games would be considered "losable". However, if it wasn't for solid hitting from Looper and those throws from Ankiel then our beloved Redbirds might not have pulled it off. Perfect throws to third from deep center and batting heroics from pitchers is not something I want to rely on. Okay...okay...I admit. We have it good right now. Real good. Second best record in the bigs. I really can't complain. However, before the break there needs to be a move. Duncan and Reyes and change for a good bat. In the near future, I'll be posting my most wanted list (a good want). In the mean time, let me know your wish list. Who would you like to see join the Cardinal ranks? Who should go? I'd love to get your feedback. What was worse last night: the Rockies announcers last night or the officiating? McKay was clearly playfully pushing Helton at first. The Cardinals clearly have had the high socks for some time--since the 1800's. Hurdle clearly was making just as many moves as TLR. Izturis clearly didn't put his glove up "in self-defense." Molina was clearly safe. Molina clearly didn't catch the foul tip third strike. Ryan looked silly at the plate in the 9th. Pujols looked like he was running better. Pujols looked like his back was hurting on the pickoff bluff at 2nd. Pujols looked like a genius in the 9th. For that 1% of the population gripin' about Pujols in the clutch: Shut up. Edit: I'd like to add that I really enjoyed the outing from Parisi. You could tell he was a bit nervous, but he had quality stuff. Good to see Izzy pitch well. His BB was controversial. That's two strong outings in a row. Let's keep it up. Flores pitched better than his stat line showed. The hits that came off him were either extended zone hits, or that weak "excuse me" swing hit that went just a bit farther than my 7 week old daughter can spit up. Def. what I call a "losable" game. But we'll take it. Mike Parisi was called up today. Always glad to see a youngin get his first shot in the show. Reyes was sent down. With all the trade rumors that were circulating around Reyes, I can't help but wonder if this will lessen his value. Last year started a chain of events which Reyes has never quite recovered from. His World Series heroics of 2006 seem to have been a premature pinnacle. I hope that he is able to get back to that form. In the end, I hope this move helps rejuvenate the bullpen. Do you agree with this move? Disagree? What do you think? Edited: Perhaps they want Reyes to get more time starting in AAA in order to demonstrate his abilities? Thanks for the great start, Mike from Stan Musial's Stance. After a perfect first, Lohse looks to carry over his sharp April to May. Lohse has been one of the most pleasant surprises about this season--and this season has been full of em. The outfield is playing out nicely. The rotation is sharp. And Pujols looks strong. Lohse was a great pickup, who, I must say, I had my doubts about. However, Dave Donuts has pulled another pitcher from his hat. Lohse quickly pulls ahead of Fukudome only to give up a leadoff single. Leadoff batters reaching base was a big problem for the Cards last year. This year it seems to have been kept to a minimum. The pitcher's best friend smiles upon Lohse as DeRosa grounds into the DP. Speaking of which, I just found a store that sells Dr. Pepper here in Ireland. Now if I could just rustle up some IBC Rootbeer I'll be good to go...oh yeah...the blog. With the bases cleared Lohse gets Soto to ground out to shortstop. Another strong inning for Kyle. I'm really likin' him more and more with each start. Luds strikes out on four pitches. 1st pitch swinging again. I love Luds. IMHO he should be more regular in the outfield, however...Luds gets behind a bit too often. I'd like to see him laying off some more in order to be more effective in front of Pujols. Since the lineup has been changed again it's a bit different. Nevertheless, does anyone think that Luds could be good enough protection from Pujols? I don't know if he is the long term answer. As I have said several times before: Protection for Pujols should be the number one acquisition priority. Number two? Bullpen issues. Who would you be comfortable with? Izzy? Not anymore. Reyes? Still not what was expected. Springer? Hardly. Fraklin, Villone, Flores, and McC? Better but still not where we wanna be. Number three? Doing something with Izturis. His glove aside, he's got to go. Reyes for Greene (SD) sounds promising. Once Carp gets back the bullpen will be strengthened. Surprise, surprise. Glaus flied out again. Think he's been scouted? Seriously, they know how to pitch him every time. I'm really gettin' fed up with folks talkin' about how many RBI's he's getting. Seriously, I could get RBI's when Pujols et.al. are ALWAYS gettin' on a head of me. Ankiel is in a different spot in the lineup. I think these changes are NOT good for the team. I'd like to see more of a rhythm get setup. Skip should be leading off. Luds with his sick OPS should be second. Pujols third. Ankiel cleanup. Glaus 5th--IF he starts slugging. Kennedy and Molina 6 and 7. Pitcher 8th and Ryan (not Izturis) as the additional leadoff. Ankiel grounds out. A rather lackluster inning for the Cardinals here. Bummer--I hoped I would have more to talk about. Well, here's hopin' that the Redbirds come to life with the bats later on. Thanks for stoppin' by. Feel free to stop by in the future as we rant, rave, and review more Cards action. I'll now pass the baton over to Mike at Mike on the Cards. Enjoy the progressive blog and go Cards!